This is one of a series of posts about boosting loyalty and engagement among customers, employees and investors. Yesterday I visited Tedworth House, the new Personnel Recovery Centre from Help for Heroes. I was there to see the CFO of H4H, and he showed me around the amazing facilities that they are building to look after recovering servicemen and women. Jonathan brought me a cup of coffee at the canteen and paid using a card. He carries an impressive collection of loyalty cards, and as Jan behind the counter made the coffee he told me a story about loyalty which clearly shows why Help for Heroes has done such a great job of capturing the public loyalty in the last 4 years. I asked about the roles played by contractors at Tedworth House. I had noticed that Jan was working for a separate organisation called Blue Apple. Jonathan explained that engaging with contractors was a high priority at Help for Heroes, and that with so many different experts involved in the recovery process it was essential to help everyone feel fully involved. Then he told me about a recent crime. The Tedworth House mascot is a large bear, naturally called Ted, and he lives behind the canteen. A few months ago, Ted disappeared. Shortly after his disappearance, a ransom note appeared, demanding that the canteen staff raise money for Help for Heroes to secure Ted's return. Further photos appeared showing a blindfolded Ted with menacing looking masked guards. Jan and her colleague from Blue Apple set about collecting funds and quickly hit their fundraising target, but the kidnappers - or bearnappers as they became known - continued to demand more. Eventually Ted was released, and when I visited he was seated in comfort in the canteen, where I photographed him with a relieved Jan.
Jan and her team mates are committed to the work of Help for Heroes and even though they are employed by a separate organisation they play a valuable part in the life and vibrancy of the recovery centre, which is a positive and optimistic place. As a visitor I was really impressed how Jan and her colleagues are an integral part of the Help for Heroes story. After all, leadership is largely about storytelling - narrative gives a focus for loyalty. And of course praise for great suppliers is always important. Jonathan told me another story of a leader in action building loyalty - and recognising the contributions of suppliers. Though Tedworth House is already a great facility, Help for Heroes has plans to make it even better, and much of the site is humming with builders and construction machinery. Bryn Parry, the founder of Help for Heroes, gathered the builders from Vinci, the building contractor, on the first day of a 26 week project, invited a couple of wounded soldiers to speak to them, presented each of them with a H4H Tshirt, and explained how important their work was. The Vinci team completed their 26 week project in 16 weeks, with builders volunteering to work 100 hour weeks to keep the project moving. 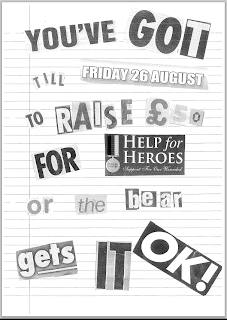 Help for Heroes is doing a great job looking after the wounded, but it is also a fine example of loyalty-building and leadership. And if you are looking for good examples in catering and construction, I can certainly recommend Blue Apple and Vinci!